Formerly part of Yugoslavia and previously better known as a potential ethnic trouble spot, Macedonia is now rapidly becoming a wi-fi hotspot. While Macedonia was spared the violence that took hold of the region after the break up of Yugoslavia in the early 1990s, more recently all eyes were on the country when its own ethnic tensions began to boil over. Luckily it avoided full-blown civil war. It is now on the brink of leading the world in what could be a template for other developing states, becoming the first wireless country. Macedonia is dotted with villages. 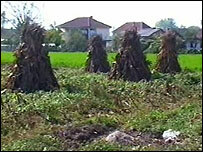 The mostly ethnic Albanians who live here are poor and rely for their livelihood on working whatever land they have. Their day-to-day lives rarely involve computers, let alone the internet. But a project funded by the US Agency for International Development (USAID) has brought broadband internet access to hundreds of such remote villages in Macedonia by putting the country's 460 primary and secondary schools online. While the computers for the labs came from China, USAID's side of the project, called Macedonia Connects, was to pay for a local company to provide wireless internet access for the nation's schools, and while doing so roll out a wireless communication network across the country. Leigh Shamblin, of USAID Macedonia, said: "We're paying for internet services in schools for two years, and because we did that the local ISP, which was chosen through the competitive process, was able to build out this network. "That will allow internet access to become affordable and accessible to people in many sectors of society." In laying out its own national network, On.Net, the Macedonian company doing the work on the ground, had to go up against the local telecoms giant which enjoyed a comfortable monopoly. "Traditionally, like in every country, there is an incumbent telecoms operator who possess all the wires across a country. And they are of course in a monopolistic environment," said On.Net's Predrag Cemerikik. "What we did is build our own backbone network across the country, and last mile access to overcome that situation." The network makes use of Macedonia's bumpy terrain by using mountains as distribution points for wireless connectivity, a network connecting the parts copper wires cannot reach. Glenn Strachan, project director of Macedonia Connects, said: "I think when people hear 'wireless' these days they think of wi-fi connectivity and Wimax, which is the newest brand of wireless connectivity. "What we have is an ability to transmit wirelessly throughout the country, and then put a piece of equipment at the school anywhere in this country. "Those people, once they have that piece of equipment, will have internet connectivity." By using what is called mesh technology, Macedonia Connects is creating not wi-fi hot-spots, but hot-zones which stretch 15 kilometres over a city. Opinions are divided on projects like Macedonia Connects. Some question whether many of these people really need broadband connectivity, and others insist the internet should stand alongside roads, water and electricity as essential infrastructure. Could this wireless project really help inter-ethnic relations? In Macedonia, where the spectre of a civil war that was narrowly avoided still remains, there is faith that the internet might ease community tensions. 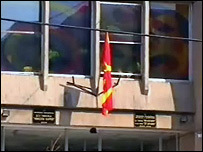 In schools, for example, ethnic Macedonians and ethnic Albanians are often taught separately. In some schools there are two different principals, two different sets of teachers, and two different names depending on which ethnic group is attending at the time. The hope is that the Macedonia Connects project will bridge some of these divisions. "It should serve as a very useful tool for interactive communication between multi-ethnic schools. They can organise a debate between them. They can organise some events between them," said Zoran Popovski, secretary of state for education and science. If people living in the same town cannot get on it might be an idle hope that the internet will magically get them talking to each other. What the internet can do, however, is what it has done everywhere else: help businesses make money. "We need the internet as a sea," said Jani Makraduli, MP and president of the Macedonia technology committee. "Macedonia is not on the sea, so we think that the internet is our sea and an open window for a lot of economic changes and new economic growth in our country." The internet might not be the hi-tech cure for Macedonia's ethnic tensions, however what is going on here could certainly be a template for other medium-sized countries. Former Yugoslav Republic of Macedonia might be the first wireless country. But it is unlikely to be the last.